May | 2014 | What is ML Reading? Today I surprised ML and visited her class to tell about what I do at my job. She was super excited and helped me with the story time. 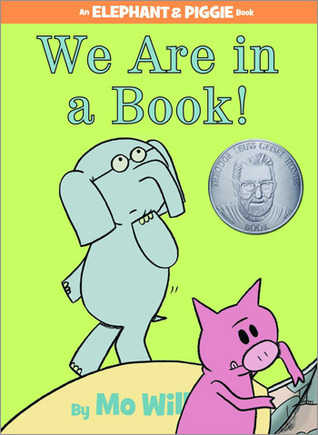 We did a shared reading of an Elephant & Piggie book and the puppet show we performed for the incoming kindergarteners yesterday. Not only did I perform a story time, I booktalked. For those of you in the non-library world, it’s telling a little bit about a book to entice readers. I chose a new group of beginning reader chapter books by Scholastic Books to highlight called Branches. The students were intrigued by the books. Hopefully, they will visit the public library this summer and check some out. I consider the most important part of my job getting books to readers. There are eight series in this collection. I’ve read snippets from four of the series. Descriptions of the series are straight from Scholastic’s website. Plus a sentence on what I think will appeal to readers from the books I’ve physically laid my hands on. 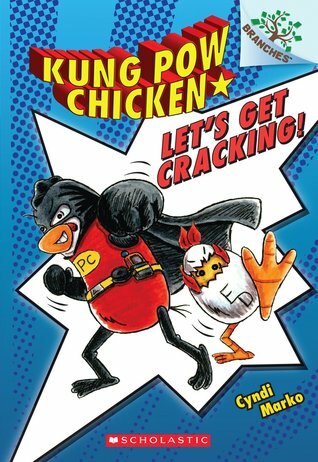 Kung Pow Chicken by Cindi Marko – “Gordon Blue was an ordinary second grader — until he became the superhero known as Kung Pow Chicken! Now he battles bad guys all over town!” Readers will like the colorful pages, and the intermixing of traditional text with comic book bubbles. 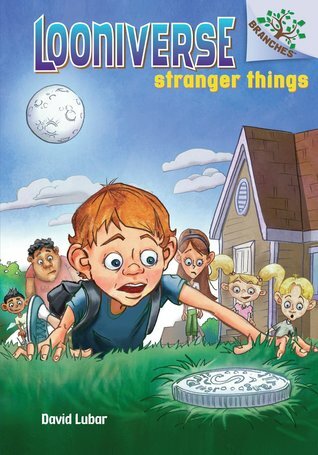 Looniverse by David Lubar – “A magical coin makes Ed’s universe go more than a little loony in this edge-of-your-seat series.” Readers will like the quirky stories and the funny illustrations. 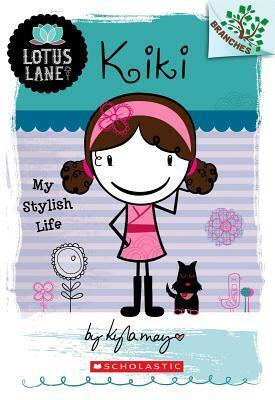 Lotus Lane by Kyla May – “These fun diaries give readers a glimpse into the fabulous Lotus Lane Girls Club.” Readers will like the diary format and the illustrations interspersed throughout the diary entries. 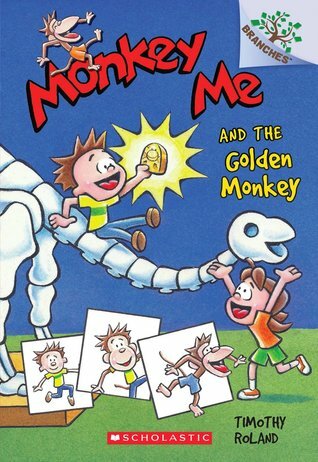 Monkey Me by Timothy Roland – “Thanks to a wacky banana, energetic Clyde turns into a monkey when he gets excited!” Readers will like the combination of narrative text and comic strip format. 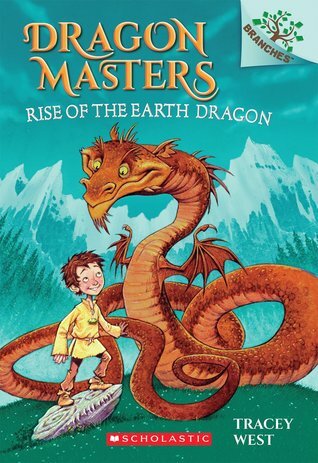 I am glad to have additional beginning chapter books to share with readers this summer beyond my regular go tos… Magic Tree House, Flat Stanley, and Rainbow Magic. I am a member of the Friends of the Library at ML’s school. In previous years, the school librarian presented a story time for incoming kindergartners near the end of the school year. Between End of Grade Tests and other responsibilities the media specialist wasn’t able to work one in her schedule. So I volunteered to do it. At 8:30 a.m. this morning, ML and I shared books, songs, a flannelboard game and puppets with these rising kindergartners. Some of her friends’ siblings were in the crowd so it was extra fun. ML is an excellent story time presenter. 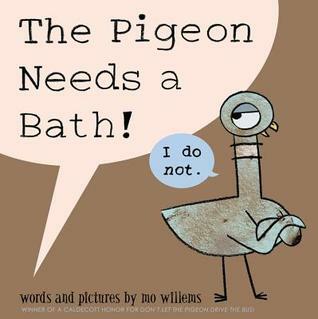 She read The Pigeon Needs a Bath, played the flannel game with the kids and performed in the puppet show. Below is what we did. And D is for down. Puppet Show – Using the tune “The Wheels on the Bus” we performed a show with animal puppets and appropriate props for various people found at school. ML doesn’t know I’ll be sharing this story time tomorrow with her class. Then, I’ll tell the students all about being a librarian. Shhhh! It’s a secret. I read so many picture books. Sometimes I forget which ones ML and I read together. 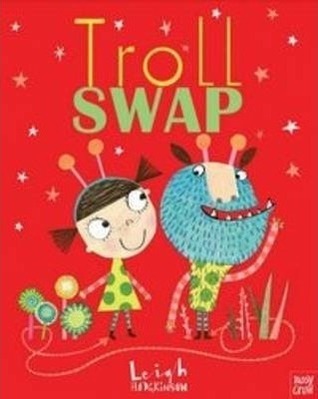 The other night I pulled out Troll Swap by Leigh Hodgkinson. ML insisted, “Mommy! We’ve read it before!” I said, “I don’t think so.” She promised, “We did! 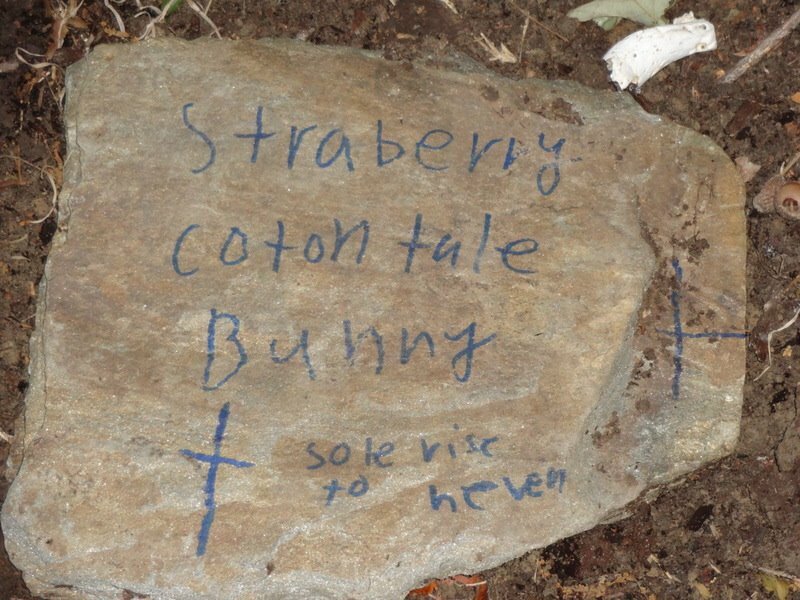 It’s really good, so we can read it again.” ML was correct. We did read it together a few weeks ago. We enjoyed the book even more the second time. We spent the evening laughing at the new details we discovered in the illustrations. ML loves how the troll’s outfit and the girl’s outfit match. I don’t often name the publishers of books, but I want to highlight the publishers of these two books. Nosy Crow, the publisher of Troll Swap, began publishing in 2011. 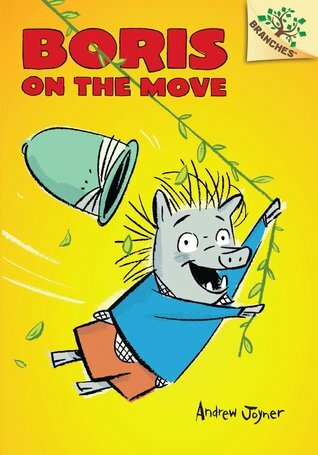 In just three years, they’ve published award-winning, kid approved books. 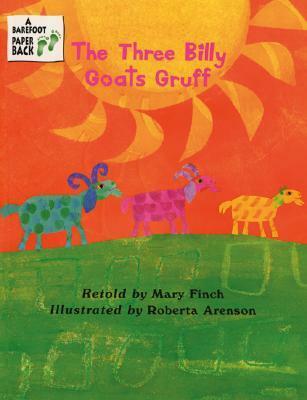 Barefoot Books, the publisher of The Three Billy Goats Gruff, began in 1992. 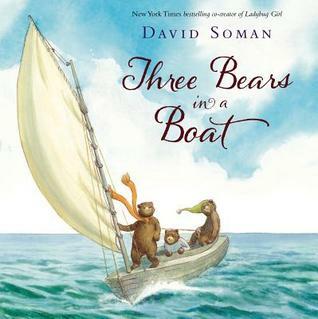 Several of my favorite books to read in story time are published by Barefoot Books. 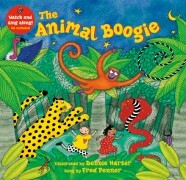 The Animal Boogie sung by Fred Penner and illustrated by Debbie Harter is my go to for a group filled with children of all ages. WordPress informed me this week, it’s the first anniversary of ML Reads. When I started the blog, I did it on a whim. Just a fun way to share books with friends. I had no idea how much it would enrich my life; nor how it would evolve. So 217 posts later with over 10,000 page views. . . this is what I’ve learned. I’ve created a wonderful journal of ML’s reading and important events in our life. Most make me smile; but the one about her friend dying hurts my heart every time I read it. 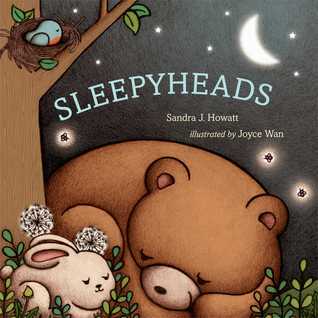 Authors and illustrators of children books are amazing. Not only do they provide high quality books for children, they are kind. A month or so into the blog I decided to contact authors and illustrators when they were featured. I receive responses from the vast majority. Some send ML copies of their books. Others provide a sneak peak to artwork from an upcoming book. A few even follow my blog. I didn’t expect any of this when I started the blog. All the authors and illustrators are gracious and appreciate learning how much ML enjoys their books. People from all over the world view my blog… 78 countries and counting. Writing is hard work. 211 posts are in some sort of draft yet to be finished. 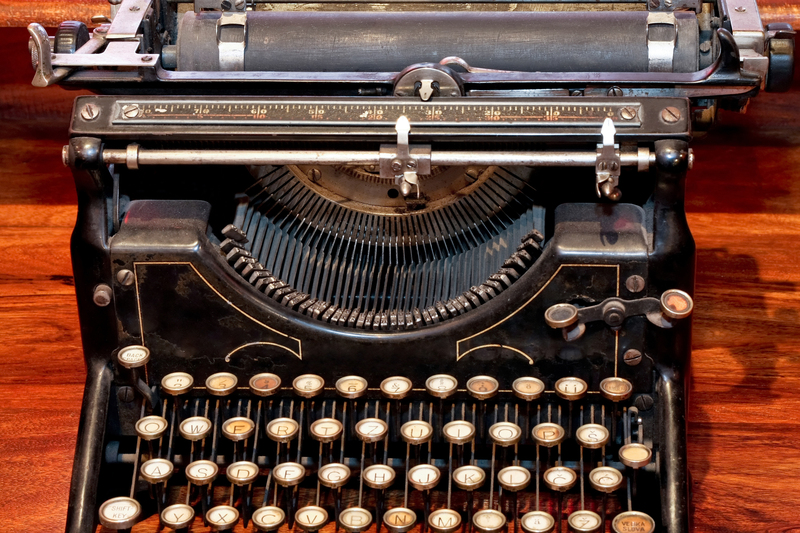 I’m a better librarian for keeping this blog. It’s renewed my enthusiasm for helping children find books they may enjoy. I love it when they let me know if they like it or not. I plan to continue posting for another year. As ML grows I know the blog will continue to evolve. 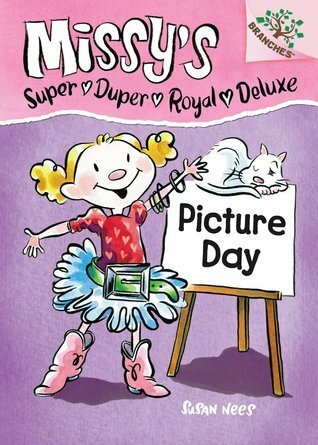 With my love of picture books and ML’s interest in art, sharing about new picture books will be a permanent feature. I anticipate ML’s reading skills to ramp up exponentially in the next year. Maybe I’ll have her write posts on the chapter books she loves. Yesterday, I alluded to bunnies in our yard. 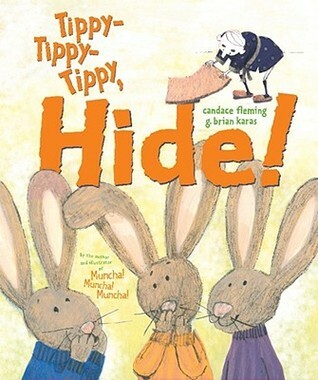 Today, I am highlighting a trilogy of bunny books by Candace Fleming and illustrated by G. Brian Karas. And sharing some very sad news about one of our bunnies living in the urban wild. 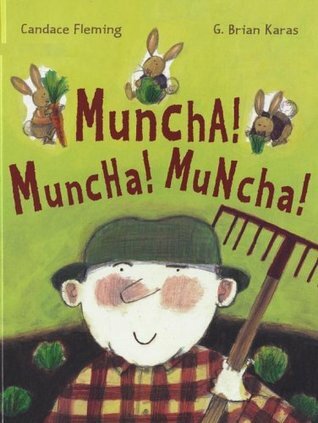 In the first book, Muncha! Muncha! Muncha! a very grumpy Mr. McGreeley is inundated with bunnies eating his garden. Each day he works hard to keep the bunnies out of his garden. Every night the bunnies muncha, muncha, muncha. Winter’s arrived in the next book of the series… Tippy, Tippy, Tippy Hide! Mr. McGreeley looks forward to a quiet winter with no bunnies. Doesn’t happen. Those pufftails invade his home. 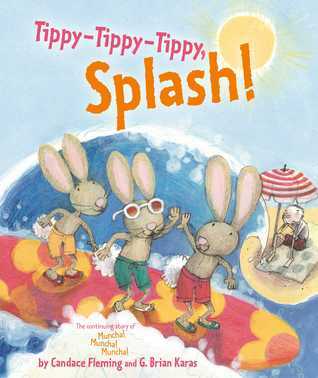 In the final book of the trilogy, Tippy-Tippy-Tippy, Splash!, Mr. McGreeley decides to visit the beach to escape the bunnies who drive him crazy. No such luck. They hitch a ride. Guess who buried the bunny? Personally, I think I deserve a Mom of the Year award. The tombstone ML made is below. She also took photos of the dead bunny. I’ll spare you. It comforted ML she had made a special bunny salad of dandelions, clover and strawberries for the bunnies Sunday evening. As for the person who sped down our street sometime between 6 and 8 p.m. and hit the hind leg of our “pet,” your speeding made my daughter cry. Was the three seconds faster you got to your destination worth it? 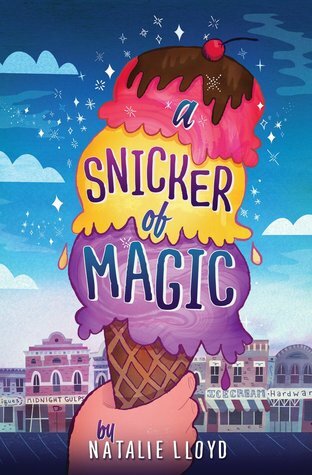 I’m giving A Snicker of Magic by Natalie Lloyd the highest compliment I can give a chapter book. I don’t plan to finish reading it anytime soon. ML saw me reading it the other night. The cover peaked her curiosity. Great job Gilbert Ford. Illustrators of book jackets don’t get the credit they deserve. ML: Are you going to recommend that book to me when I’m older? Me: I don’t know. I’ve only read the first chapter, but Miss Jenn loved it. I’ve read half the book and I’m stopping. I want ML and I to experience the magic of this book unfold at the same time. I’ve read enough to know it’s going to be great. 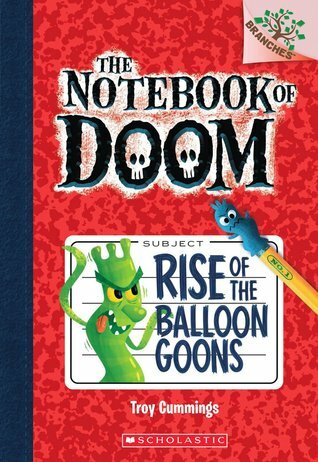 Sometime between 4th-7th grade we’ll read this book. Below is the publishers synopsis. 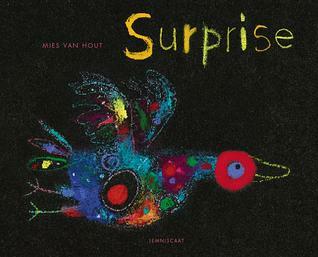 Last night ML pulled out the book Surprise by Mies Van Hout from the stack of new picture books I checked out this past week. A perfect choice for Mother’s Day. Each page spread includes a page with one word. 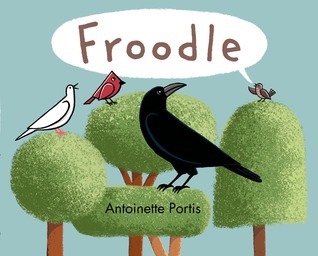 The other page includes a black background with bright pastel, child-like illustrations of baby birds and their parents. Many aspects of parenting are covered… yearning, hoping, expecting, marveling, caring, comforting, cherishing, teasing, enjoying, listening, encouraging, and letting go. Dear Ms. Shaw, Sorry ML was late for school. We were bird watching. Last week, I caught ML looking out the mail slot of the front door. She continued doing this for five minutes while I rushed around getting my stuff together for work. Finally, I asked, “What are you looking at?” Her response, “The most beautiful bird I’ve ever seen.” Two bright yellow birds were flitting around in our neighbor’s tree. So I did what all responsible librarians do. I posted a question on Facebook, hoping a friend knew more about birds than I. Several did. Then, I looked for books at the library. 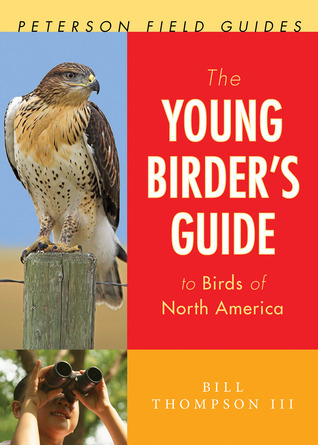 Someone recommended National Audubon Society Field Guide to Birds but it was checked out. 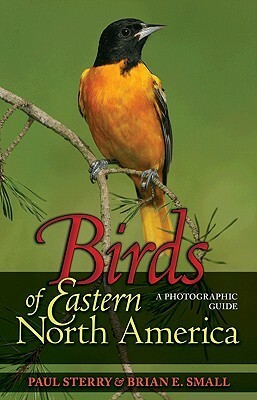 I found Birds of Eastern North America by Paul Sterry & Brian E. Small and The Young Birder’s Guide to Birds of North America by Bill Thompson III. Both of these bird books are easy to use with large detailed, photographs. In no time, ML was able to identify the bird. 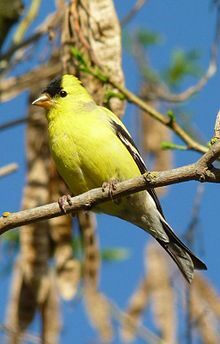 It was a goldfinch. 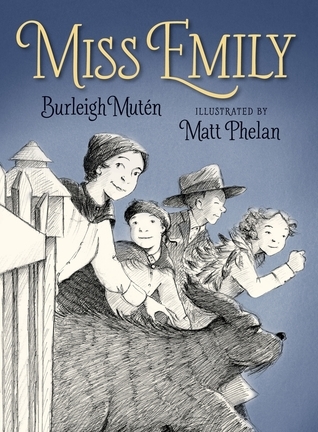 …a new book arrived at the library Miss Emily by Burleigh Muten and illustrated by Matt Phelan. It’s a fictionalized account from the viewpoint of MacGregor Jenkins, the pastor’s son and playmate of Dickinson’s niece and nephew. This story is set after Emily Dickinson withdrew from society to live in privacy. However, the circus train is coming to town and Miss Emily plans an evening adventure for her niece, nephew and their friends long after bedtime. Sneaking out of the house, pretending to be gypsies and mingling with circus performers… a night to remember. As you would expect, the text is lyrical. The illustrations intermixed throughout the book are subtle yet detailed. Read the book and you will understand why the poem excerpt beginning “We never know how high we are…” is Emily Dickinson’s only poem highlighted in this book. I’m saving this book for ML and I to read aloud this summer when she attends camp at Cirque de Vol. When ML was three she said, “I know I popped out of you, but how did I get in?” We were in a restaurant, not the most conducive place for explaining how babies are made. So I did what I do often, I turned it back to her with a question. “How do you think?” She replied, “I think I popped into you.” Technically she was right. So I agreed and the conversation ended. A few weeks ago, she called me to tell me she was getting a new sibling. Obviously and thankfully, not from me. 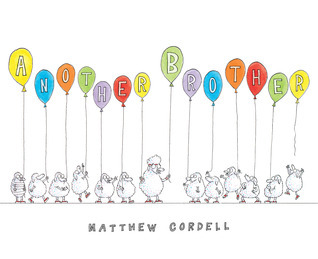 Yesterday, she stuck out her lips, moped and shuffled her feet while complaining “It’s going to be another brother.” Immediately, I thought of one of my favorite picture books from 2012, Another Brother by Matthew Cordell. I posted about it last July when ML”s friend’s second brother arrived. I’m bringing it home tonight. 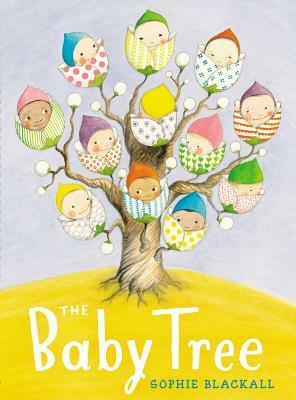 Today, a new book arrived at the library called The Baby Tree by Sophie Blackall. Looking at the cover, I wasn’t sure what to expect. Truthfully, the cover freaked me out a little. But it’s one of my favorite author/illustrators; so I withheld judgement. This is a case where you can’t judge a book by it’s cover. A young boy learns a new baby is coming. He begins questioning people on where babies come from and receives a variety of answers. ML’s seven and it’s time she learned how babies are made. This book will provide a perfect segway into the conversation. Any advice or stories of your experience explaining where babies come from to children? Two of ML’s friends love science and history. When I say love history, I mean LOVE history. 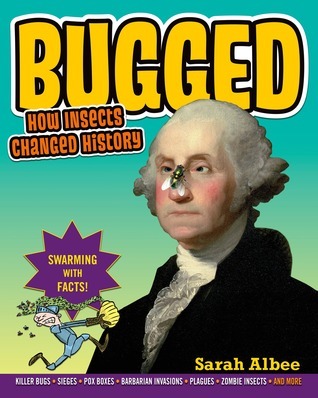 When Bugged: How Insects Changed History by Sarah Albee and illustrated by Robert Leighton arrived at the library, I knew I needed to share it with the world. Earlier this year, I posted about their book Poop Happened: A History of the World From the Bottom Up. It was fascinating. I flipped through Bugged and already learned a few things. Can you name nine Presidents who suffered malaria? 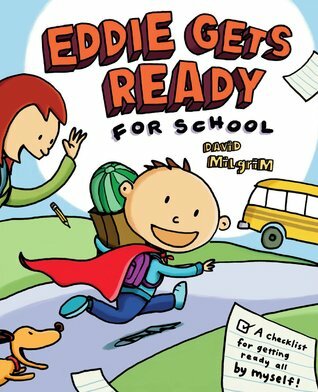 Ask Eli and Will after they read this book. In the meantime, feel sorry for Zachary Taylor whose illnesses included yellow fever, malaria, dysentery and possibly cholera or typhus. I admit my knowledge about President Taylor is limited to his name. Anybody know why he contracted so many insect borne illnesses?